During the 12th day of Oscar Pistorius’ trial in Pretoria his defense team accused police photographer Bennie Van Staden of mishandling the crime scene. Oscar Pistorius’ lawyer Barry Roux said some images showed “great disturbance” was caused to the evidence but the police officer insisted he had followed procedure. The Paralympic champion denies murdering his girlfriend Reeva Steenkamp last year, saying he thought she was an intruder. The prosecution says Oscar Pistorius intentionally shot Reeva Steenkamp after an argument. The court also heard from a police ballistics expert on Tuesday, but the trial was adjourned before he explained the key points of his investigation into the trajectory of the bullets from Oscar Pistorius’ gun. Captain Christian Mangena said he had measured Oscar Pistorius with his prosthetic legs on and off to try to determine whether he was wearing them or not. He is expected to disclose the results of his inquiries on Wednesday. 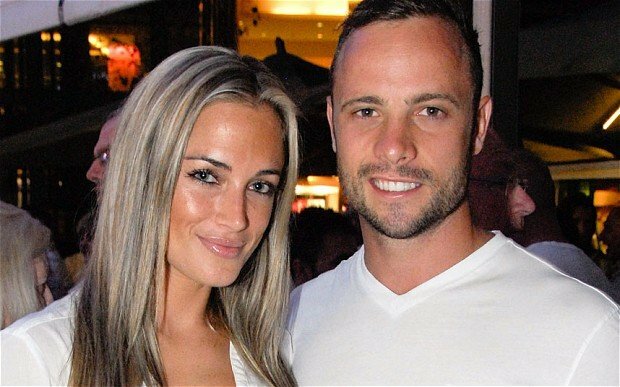 Correspondents say whether or not Oscar Pistorius was on his prosthetic limbs is important because it could match parts of his story that he accidentally shot Reeva Steenkamp at his house on Valentine’s Day 2013. Photographs of the bloody scene at Oscar Pistorius’ house were shown to court as police photographer Bennie Van Staden was cross-examined by defense lawyer Barry Roux for a second day. Barry Roux painstakingly examined pictures taken by Bennie Van Staden and another police officer, and said evidence had been moved around in violation of police procedure. The lawyer challenged Bennie Van Staden over two images of Oscar Pistorius’ bedroom, which showed tissues, a CD and a remote control in different positions. Bennie Van Staden admitted that he had moved bloodied towels and a duvet to check for further evidence, but said that he had taken pictures of the original scene before doing so. Barry Roux also used metadata on each photo to suggest that the two policemen were taking pictures in the same room at the same point, despite Bennie Van Staden testifying that he had worked alone. According to times on the photographs, both Bennie Van Staden and the other police officer, identified as Colonel Motha, were in the bathroom at the same time. Prosecutor Gerrie Nel questioned Barry Roux’s assertion that the two policemen had been working together, asking why it was that the other officer had not been captured in any of Bennie Van Staden’s pictures. The prosecutor also said that debating whether the cricket bat that Oscar Pistorius used to smash open the bathroom door had been moved “millimetres” for a photograph did not change the fact that is was covered in blood. Bennie Van Staden took hundreds of images at the scene, including several of the bloodied cricket bat as well as bullet casings and a gun. He was called to the scene at around 04:50 a.m. local time and took pictures of the accused and the deceased, as well as pictures of the rooms of the house. The photographer described nine images that he took of Oscar Pistorius soon after the shooting, with the athlete wearing blood-soaked shorts in the garage of his home. Barry Roux has challenged previous police witnesses over details of their movements in a bid to uncover contradictions that support his argument that the investigation was bungled. So far, Oscar Pistoius’ defense team has pointed out several errors by police investigators, including an officer handling the suspected murder weapon without gloves and another stealing from the house.